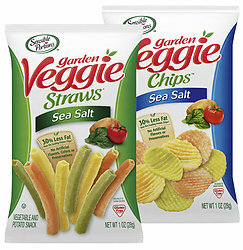 Garden Veggie Straws and Chips. A tempting treat made with all natural ingredients and have 30% Less Fat than the Leading Potato Chip. A better snack for you that has no artificial flavors or preservatives. Also a Non-GMO, Kosher and Vegan snack that has not trans fat or cholesterol. Made with all Natural Ingredients. A Kosher and Vegan snack that is Non-GMO.